On Monday, October 19, 1998, four military radar stations in Hebei province, China, reported the presence of an unidentified blip hovering above a military flight training school in Changzhou. 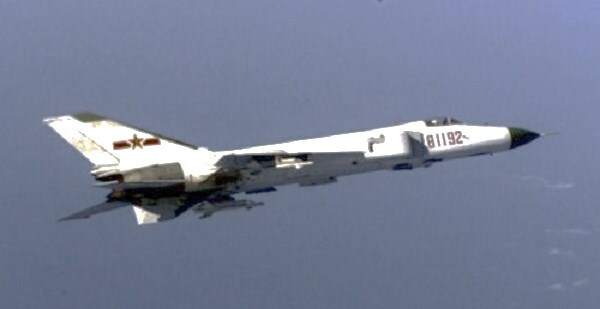 Once authorities determined that the intruder was not a military or civilian flight, Colonel Li, the base commander, ordered a Jianjiao 6 jet fighter to take off and intercept the UFO. At least 140 people on the ground saw the object. To observers at the base, the UFO first appeared to be “a small star” and then grew larger and larger, perhaps as it descended to a lower altitude, the report said. They described an object with a mushroom-shaped dome on top and a flat bottom covered with bright, continually-rotating lights. The crew of the Jianjiao 6 interceptor consisted of a pilot and a radar officer. The two officers said “the object clearly resembled depictions they had seen in foreign science fiction films. When they got within 4,000 meters (13,200 feet) of the UFO over Qing county, it abruptly shot upward, easily evading subsequent attempts to get closer. It appeared to be toying with the fighter by repeatedly outdistancing it and then reappearing right above it, the report said. The pilot requested permission to fire on the UFO with the plane’s automatic 20mm cannon. He was denied permission to shoot by ground control and was told to continue to pursue and observe the object. The pilot broke off pursuit at an altitude of 12,000 meters (39,600 feet) when the jet began running low on fuel. The UFO then disappeared before two more modern (Chinese fighter) planes could arrive in the area. Changzhou is 150 kilometers (90 miles) northwest of Shanghai. (See the Hong Kong Standard for November 4, 1998. The story apparently first ran in the Hebei Daily around October 22 and was picked up by the Chinese weekly newsmagazine Baokhan Wenzhai. Many thanks to Errol Bruce-Knapp and Andy Denne of A.U.R.A. for forwarding the article.) NOTE: The above image is a rendering. I just want to say I am new to weblog and really liked you’re blog site. Almost certainly I’m going to bookmark your website . You definitely come with very good article content. Bless you for revealing your web page. Useful info. Lucky me I discovered your web site accidentally, and I am shocked why this twist of fate didn’t came about earlier! I bookmarked it. You could definitely see your skills in the work you write. The sector hopes for even more passionate writers such as you who are not afraid to say how they believe. At all times follow your heart. I have been checking out some of your stories and i can state pretty nice stuff. I will surely bookmark your website. Hi there, I discovered your web site by the use of Google at the same time as searching for a similar topic, your web site got here up, it appears good. I have bookmarked it in my google bookmarks. hey there and thank you for your info – I have definitely picked up anything new from right here. I did however expertise several technical points using this web site, as I experienced to reload the site a lot of times previous to I could get it to load correctly. I had been wondering if your web hosting is OK? Not that I am complaining, but slow loading instances times will often affect your placement in google and could damage your quality score if ads and marketing with Adwords. Anyway I’m adding this RSS to my email and can look out for a lot more of your respective exciting content. Make sure you update this again soon..
You’re certainly correct, I’d really like to find out even more on this particular topic! I’m also captivated by omega xl tablets because I feel it really is very unique right now. Keep up the good work! Together with everything which seems to be building throughout this area, a significant percentage of viewpoints tend to be quite refreshing. Nonetheless, I am sorry, but I can not give credence to your entire plan, all be it stimulating none the less. It appears to me that your opinions are actually not completely justified and in fact you are generally your self not really fully certain of your argument. In any case I did enjoy reading through it. 6mcLb6 Simply wanna remark that you have a very decent site, I the design it really stands out.